Oris Paxton and Mantis James Van Sweringen—two enterprising brothers from Cleveland’s east side—entered the real estate business by selling options on property on Carnegie Avenue and the west-side suburb of Lakewood. In 1905, they purchased some acreage along North Park Boulevard, one of a series of boulevards that had been laid out along Cleveland’s newly created park system surrounding Doan Brook and a group of lakes created by the North Union Society of the Millennium Church of United Believers, otherwise known as the Shakers. The Shakers had owned the land since 1822. By the 1880s, the sect’s membership had dwindled to a handful of believers, and the community dissolved in 1889. Within three years the land was sold to a group of Cleveland investors. Legend has it that the wife of one of the investors suggested that the property be named Shaker Heights because it had been owned by the Shakers and was located in the hills above Cleveland. 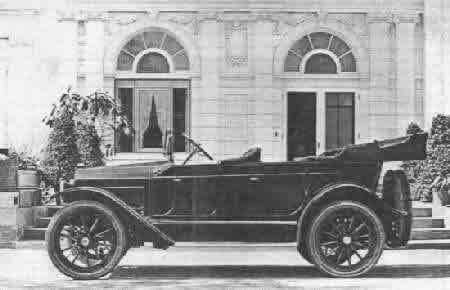 Peerless Motorcar ad, posed in front of 3001 Fairmount Blvd. The Shaker Heights Land Company, as the investors called themselves, soon sold it to a group of investors from Buffalo, NY, for $316,000. The Buffalo Group marketed the property under the Shaker Land Company name. Engineering company, F.A. Pease, laid out large, estate-sized lots along North Park, South Park and Fairmount Boulevards. The financial depression of the 1890s, however, hurt real estate sales and few lots were sold. The property became overgrown with weeds, and its value dropped to $240,000. In 1905, the Van Sweringen brothers purchased and resold some Shaker Land Company lots along North Park Boulevard, and they soon negotiated an agreement that would enable them to finance additional land purchases with the proceeds of previous sales. In order to ensure success, however, the brothers believed they needed to make Shaker Heights accessible to a greater segment of Cleveland’s population. In 1906 the Vans persuaded the Cleveland Electric Railway Company to extend its Cedar Hill line to Fairmount Boulevard. They convinced the railway and property owners that the line would profit from city dwellers recreating at the Shaker Lakes and from the commuting suburbanites who would populate their new development. By 1907 the Shaker Lakes line was up and running, and development along Fairmount Boulevard started in earnest. In 1908 the Vans exercised options to purchase the remainder of the Shaker Land Company’s holdings. The Vans called themselves the Shaker Heights Improvement Company and worked with the F.A. Pease Co. to modify plans for Shaker Heights. The Vans envisioned not country estates for the very wealthy, but a garden city with lots large enough for a substantial home and small enough for the average commuting businessman to maintain. Their ideas drew from those of the British Garden City Movement that maintained good architecture and landscape design could improve upon nature and create harmony and beauty. Gently curving streets with British names radiated from Fairmount Boulevard. The Vans placed restrictions on the property to enforce minimum lot size, a minimum construction cost and the use of a competent architect to create a “general architectural beauty and a tone of permanence in harmony with the surroundings.” These restrictions and others, such as prohibition of saloons and commercial establishments, were as much a precautionary response to the demise of Euclid Avenue and many other Cleveland neighborhoods as they were an appeal to beauty. By 1912, several homes had been built and the area became known as Shaker Village. The Vans extended the streetcar line down Coventry Road and began to develop home sites along other portions of the original Shaker lands. The new City of Cleveland Heights annexed the Fairmount Boulevard district, while the southern portion of the Van Sweringen development became its own municipality, the City of Shaker Heights. Fairmount Boulevard features the work of Cleveland’s best architects, including Howell and Thomas, Harold Fullerton, Meade and Hamilton, Charles Schneider, Charles Schweinfurth, Harlen Shimmin, Frederick Striebinger, and Walker and Weeks. In 1976, the National Park Service placed the Fairmount Boulevard Historic District (Fairmount Boulevard from Cedar Road to Wellington Road) on the National Register of Historic Places, recognizing it as an excellent, early-20th-Century planned community of architect-designed homes. In 1984, a significant portion of the City of Shaker Heights was placed on the National Register. Work has begun to someday include the entire Van Sweringen development in Cleveland Heights on the National Register.